Everyone I know has skills that are valuable and don’t fit on a traditional resume’. Those skills could lead to a higher paying or more fulfilling job, but often people simply don’t know how or what to look for. Technology and specifically several interoperability standards are changing this dynamic which will only help both economically disadvantaged and well-advantaged people if implemented correctly. Take me, for example. My education shows a BA in Mathematics and Psychology, Single Subject Teaching Credential in Mathematics, MA in Curriculum and Instruction, and Pre-Administration Credential. My work experience shows a bit different path — math teacher for 8.5 years, Teacher on Special Assignment in Professional Learning for one, a jump over to Lead Content Curator (curriculum specialist) for OpenEd.com, then quite the technical jump to product owner/Manager for OpenSALT at ACT, an open source competency management tool. What I’m doing now was informed by but not learned in my formal education. My days of running linux on old computers in my teens and early twenties prepared me more for my current job than anything I did as a math teacher for the most part. From a practical perspective my work experience and degrees reinforces my current work, but I definitely didn’t learn how to write github issues while being a teacher(Dave and others would probably say I still need to do better! ), or write a business plan to fund a software project. With that in mind, recently I’ve been throwing around the idea of formally furthering my education but I’m not quite sure what to do. While the idea of a doctorate would have a sense of finality, with two kids under the age of 5 and a wife that works part-time for now, time and money are pretty spoken for as it is. Also, as a believer in the competency-based economy, if I were to go back I almost feel it would be hypocritical to apply and attend a traditional program when most of the technology I work for is aiming at the micro-credential. 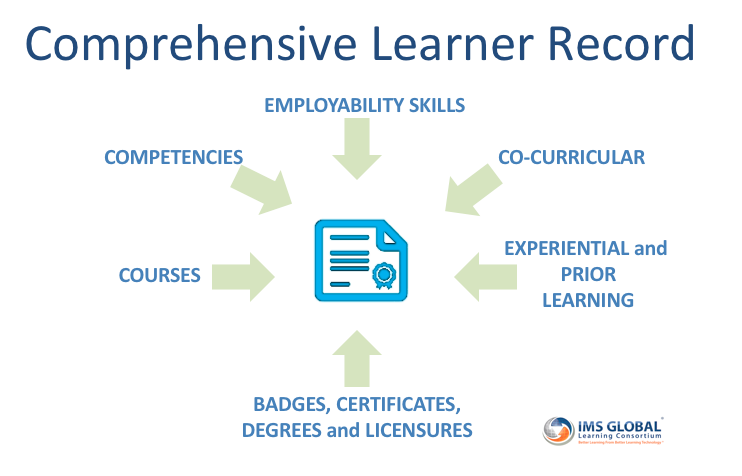 The IMS Global specification CLR for Comprehensive Learner Record seems to be the best shot we have at capturing everything about any learner to achieve the goals that we want. It captures the hard and soft skills, belongs to the user and offers up a holistic picture of learning and even potential. There are a lot of questions for the average person looking to better themselves. Where do learners go to earn digital badges for things they already (or want to) know? Badr Pathways looks like a very interesting piece of technology that helps users find badges for the taking based on keyword skill searches. I would imagine more tie ins to services here is a possibility for one stop badge attainment. Will employers recognize those digital badges unless they’re from existing universities/issuers? Does the name and reputation of a University matter anymore or is it just about the skills learned? While A handful of colleges are CBE (Capella, College for America within SNHU, etc), most still grant units based on Carnegie hours. This matters for the person pursuing a degree — they should be able to more easily see their strengths as they progress through the course not in terms of broad course names but through the threading of competencies across a program. Imagine a hypothetical situation. I’m applying for a job as a product manager with a degree in computer science from a major university. OR I’m applying for a job with a degree in education but I have earned digital badges in project management, github, data analytics and for fun ‘writing in markdown 101.” If I’m going on technical requirements, the latter candidate should be better — and the business/leadership fit could happen during the interview process if its rigorous. For learners looking to fine tune their competencies to attain higher pay, the technical foundation is ready. CASE to establish competencies and relationships between competencies, OB2.0 to verify knowledge, and organizations issuing learning records in CLR. Now we must work together within the edtech and workforce communities to drive both acceptance and prove lower cost/more efficiency. The IMS Global Credential Summitt next week in Arizona will be very exciting! Questions for feedback: Am I correct about the technical formats usage scenarios? Are you an employer or institution who has tried to utilize ‘open badges’ and been stuck somewhere along the way? What is needed to make this whole process easier? ** A play off a line from the Rhyme of the Ancient Mariner. I was going to go further and make jokes about what the industry’s ‘albatross’ being the fact that lower-income students may not be able to gain access to digital credential or tools unless accessibility is emphasized… but decided I didn’t need to mix too many metaphors for a simple blog post!